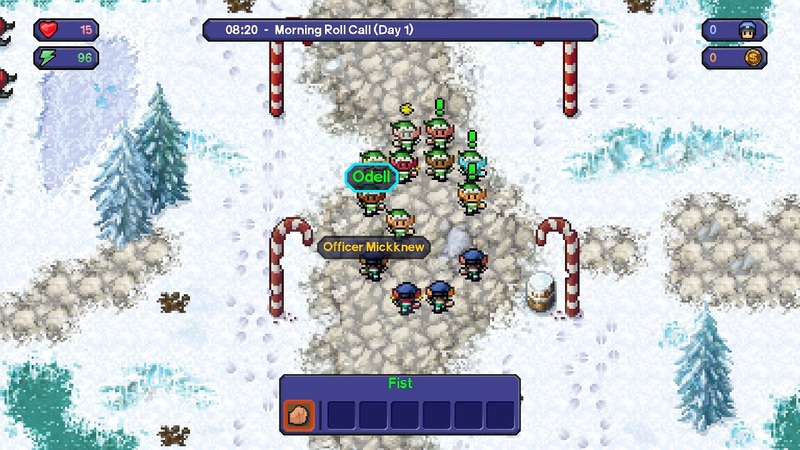 The Escapists was released in 2014 for PC and Xbox One. Later it was also released for the PS4, Mac, Linux, Android, and iOS. It has already received a ton of praise! A few DLCs were released throughout the years that added to the content and made it even more fun! Now The Escapists is coming to the Switch. 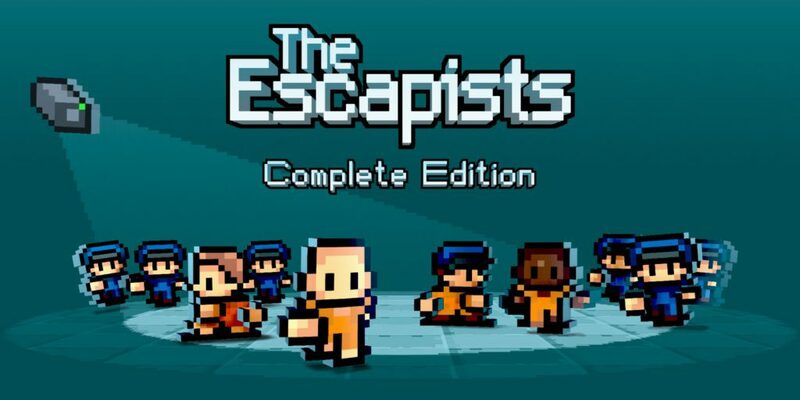 The Escapists: Complete Edition has all the previously released DLC already included. 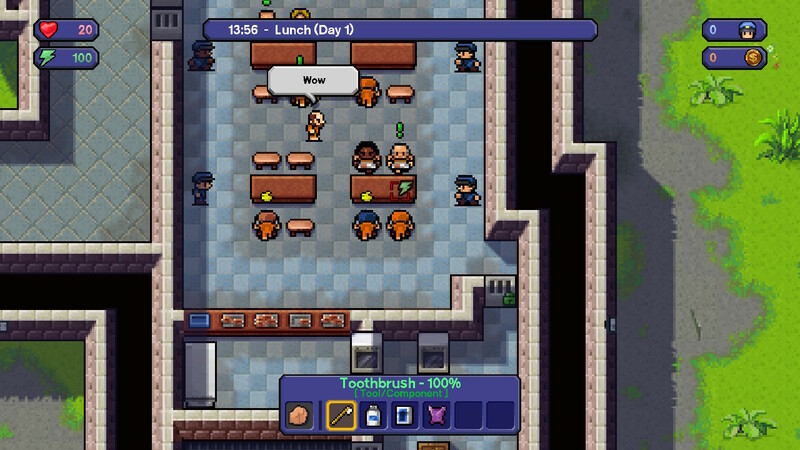 The Escapists: Complete Edition was developed by Mouldy Toof Studios and published by Team 17 and we got a chance to review it. So gathering our courage, we were ready to be thrown in (fictional) prison. 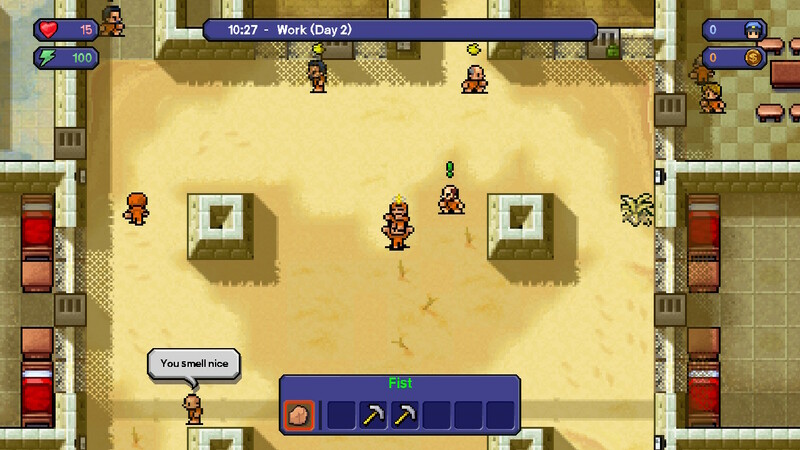 There isn’t really a story present in The Escapists. You are in prison and want to escape so you try this in any way possible. Each prison has a different outlook which changes how the characters act, the guards are different as are the inmates in each prison as well. You can make up your own story as for why you are in the prison and make it even more fun. Build your own character and decide if you are a fighter or a thinker. The graphics in The Escapists are in a simple retro pixel style. Characters in the game are as different as they can be as there is only one guard or inmate outfit with only the occasional bystander outfits. All characters keep running even if they are standing still or sitting down. Only when you use some of the fitness areas, like the bench, your character will do another animation. The backgrounds are simple but of course, it is a prison so it can’t be too fancy. Everything you would think a prison has, is included. Each prison has a different look to them, which makes it fun to find new ways to escape. Music in The Escapists sounds like it is mostly the same tones on a loop with some other tones mixed in. It isn’t that bad but you kinda get tired of it after a while. Luckily they change it at certain times to another track in the same sort of style. 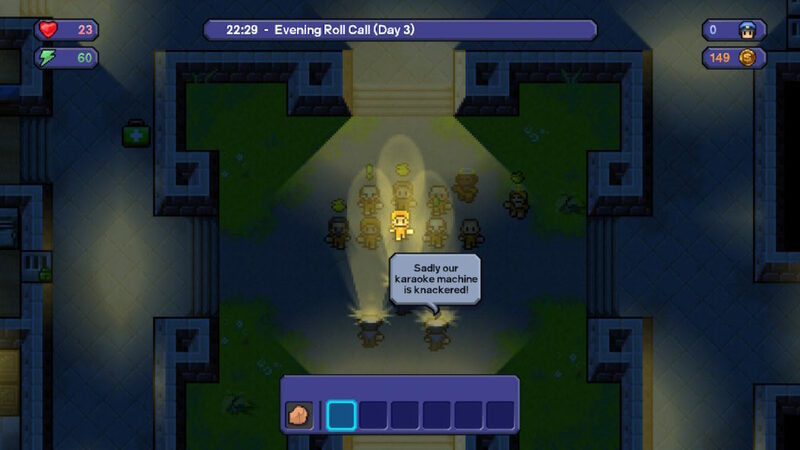 There is no voice acting present in The Escapists. Sound effects are simple but well done and smooth. 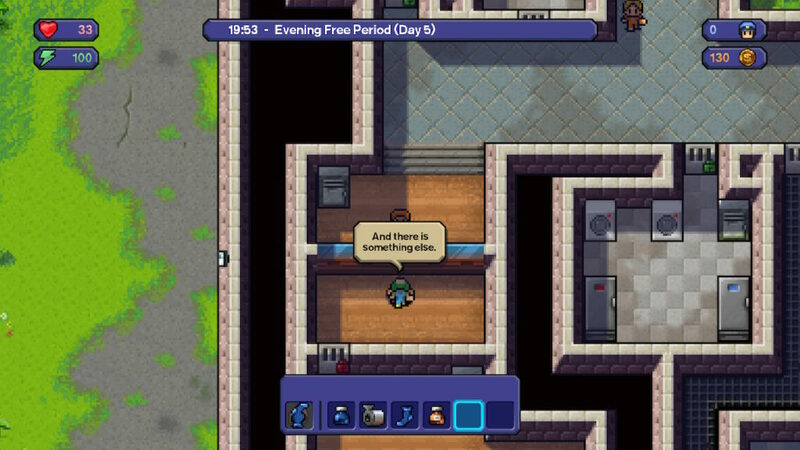 The Escapists is a Role-playing, Indie, puzzle game where you try to escape prison. You are in prison and can’t wait to escape, the question is how will you escape? Well in this game that is what you will need to figure out. As an inmate you have to follow a schedule that is set for you, if you don’t do this you will be missed and you will raise suspicion. You start the day off with a morning roll call and then breakfast. After that, you get a free period where you can do whatever you want inside the prison of course. During the free periods, you can also receive visitors by going to the visitors’ area and sitting down. After the morning free period, it’s lunchtime. After that, it’s job time. During job time you will have a job quota that you will need to fulfill or you lose your job; for a laundry job, for example, this is washing enough clothes. After Job time it is exercise time, showers and then dinner. Then you get another free period until it is time for the last roll call and then it is lights out. This schedule repeats each day. Usually, nothing happens if you just show up for a bit and then leave without the guards seeing you outside. Only a roll call can’t be missed because then the prison goes into lockdown and they start searching for you. Guards walk around randomly and tell you to hurry up and go to where you should go unless it is free period. It raises the guard’s suspicion when you are not where you’re supposed to be. There also seems a bug that they say to hurry up and go where you need to go even though you’re already there. This is quite annoying because if you have too much suspicion they start coming after you. There are three stats that your character has: strength, intelligence, and speed. Strength and speed can be improved by exercise. Intelligence can be improved by either using the computer or by reading in the library. Improving stats costs energy which you can then get back by showering, eating, sitting or sleeping. Strength and speed speak for themselves mostly but intelligence you need to be able to craft things. Some crafting recipes require you to have a higher intelligence. Crafting recipes can be gotten by buying hints on the payphone and can also sometimes be gotten from visitors or inmates that are friendly with you. There are ingredients that are legal and there are those that are forbidden in prison. These items get taken from you when you get beaten. You can also end up in solitary when they find some during a shakedown of your cell. Crafting things is quite necessary for escaping as you won’t be able to make it far without tools. Items can be bought from inmates that are selling at that moment or just found by searching through other inmates’ desk. As long as Guards don’t see you, this has no repercussion. You can get money to buy things by doing your job but also by doing favors for inmates. These requests are mostly to cause a ruckus, beat someone or retrieve an item. Sometimes it is quite annoying to give an item that the person asked for because you need to wait until they start selling before you can give things. This is because the tab with “give” can only be accessed while a character is selling. If you complete enough requests you earn friendship from that inmate. He will then help you. There seems to be a bit of a bug that when a friend starts selling that you sometimes can’t access the sell menu because it is the same button to team up. Getting out of prison is quite hard which actually makes sense. With a lot of prisons available with the extra content from the complete edition, you will surely get hours and hours of fun trying new ways to escape prison. Because of the Switch, you can take the game everywhere and it really is the perfect game to bring to a waiting room or on public transport to entertain yourself. So if you’re looking for a fun and challenging game on the Switch then The Escapists: Complete Edition is certainly for you.